I tend to update this thing when I have interesting things to say. Lately, there hasn’t been many interesting things happening. We lost the apartment, and I’m back on track saving my pennies in order to move to Los Angeles. Woo. My attractive hospital outfit and IV'd hand. However, this past weekend something remotely interesting and intensely painful happened to me. So I thought I’d share it with you all, since I have no filter for TMI apparently. Also because I’m repeating the story a lot to friends and family and it’s just easier to direct them to this URL. Friday night I had a random stomach issue–this happens to me a lot, and I always assumed I was just allergic to dairy or gluten or something and just didn’t have the motivation to figure it out. Usually I just take a pepto bismol and put on a heating pad and the feeling passes fairly quickly. I texted my friends I had plans with and assured them that though I’d be late, I’d still be able to meet up for drinks. After the pain got so bad that I vomited, I decided I probably wasn’t going anywhere that night. But I fell asleep, and the next day the pain was still there but very dull. I assumed that my allergies, which had been making me cough uncontrollably for the two weeks prior, had just pulled a muscle in my abdomen and that’s the pain I was feeling. I was also fine on Sunday. Monday I woke up at 2am with even worse pain than I had on Friday. I ran to the bathroom three times to throw up, even after my stomach was empty. I called my doctor’s office and they said to get me to the ER. I got to the ER at 6am, and was not seen until 10am. In between vomiting and screaming in pain I took time to appreciate the attractiveness of the hospital intern who administered my morphine and took my blood samples. He was a cutie. I was in no situation to flirt, with my face wedged firmly into a barf bag, but he was nice to look at. I told him it was cool he was a student and getting such hands-on experience with his future career–seriously that’s cool, right? Once I finally saw the doctor, he sent me to get an ultrasound. I was hoping they’d show me the picture and describe what they were seeing, or print it out so I could take it home and upload it to Facebook and make everyone think I was pregnant as a fun post-medical-emergency-prank, but I was in too much pain to really push the matter. When I got back to my room the doctor told me that not only was my gallbladder chock full of stones–one of which was blocking the bile distribution and thus making me vomit–it was inflamed. So the whole thing had to come out. This was helpful. My pain went from a 9 pre-surgery to a 5 post-surgery. It's at like a 3 or 4 now. I didn’t get into surgery until midnight that night. That means I couldn’t eat or drink all day, and I kept fantasizing about apple juice. All I wanted more than anything in the world was a sip of apple juice. But sadly, I was denied. No liquids or foods before surgery. Ugh. Apparently it was a very busy Monday for the hospital. I asked if I could keep the gallstones so that I could make jewelry and put them on Etsy–as my dream is to someday be featured on Regretsy. The anesthesiologist got a chuckle out of that one. He actually tried to save my organ for me so I could take it home but the nurse put the kibosh on that one. Also gallstones are not sturdy enough for jewelry making and are the consistency of cookie crumbs. The doctors assured me I’ll be bikini-ready in no time, since the scars will be hardly visible. They actually pulled the gallbladder out through my bellybutton. Sadly this means my stupid human trick of pulling my bellybutton inside out probably won’t work anymore, but it’s a small price to pay for not having a huge scar across my middle. I am grateful for that. Anyway, the surgery went well, I didn’t get nervous until I was actually on the table and they started to prepare to put me under. When I woke up was the scariest thing, because I began to freak the hell out. I thought I couldn’t breathe. They showed me the screen that showed I was breathing perfectly fine, but since I still had the tube down my throat I thought I was suffocating and would not be calmed. “Ashley, you can cough, if you can cough it means you’re breathing”–this also did not help. They sedated me again, since I was unconsolable. When I woke up from THAT I could breathe just fine and I started crying because I was embarrassed that I’d freaked out so badly. Later that night when I attempted to use the bathroom for the first time–NOTHING works after you get surgery apparently, it was the most frustrating thing–the nurse brought me apple juice. It was fantastic. 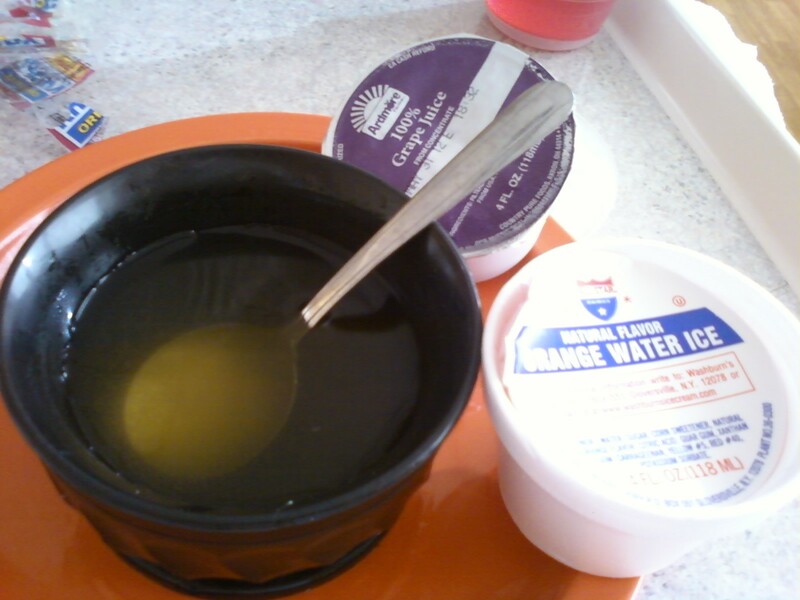 Breakfast was chicken broth and it was the most delicious thing I’d ever eaten. Chicken broth, grape juice, crackers, and Hawaiian Ice, breakfast of champions. I was sent home at 7pm last night. I am on painkillers, and stuck in bed for the most part. 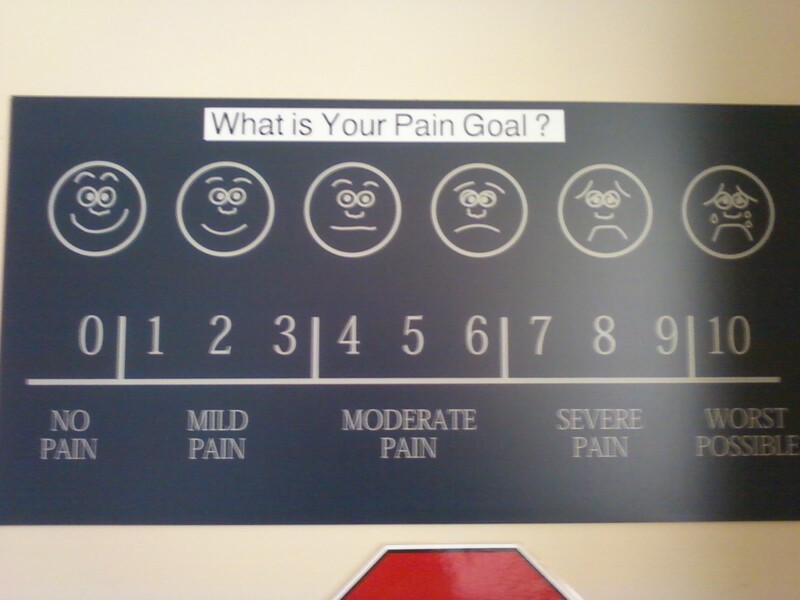 I’m still in a moderate amount of pain, but nothing compared to what my gallbladder was doing to me on Monday. I’m out of work for the rest of the week, but should be back by next week. My plan for the next few days is to sleep a lot, try to walk around as much as I can, and slowly get back to eating real food. You have no idea how much I’m craving french fries right now. 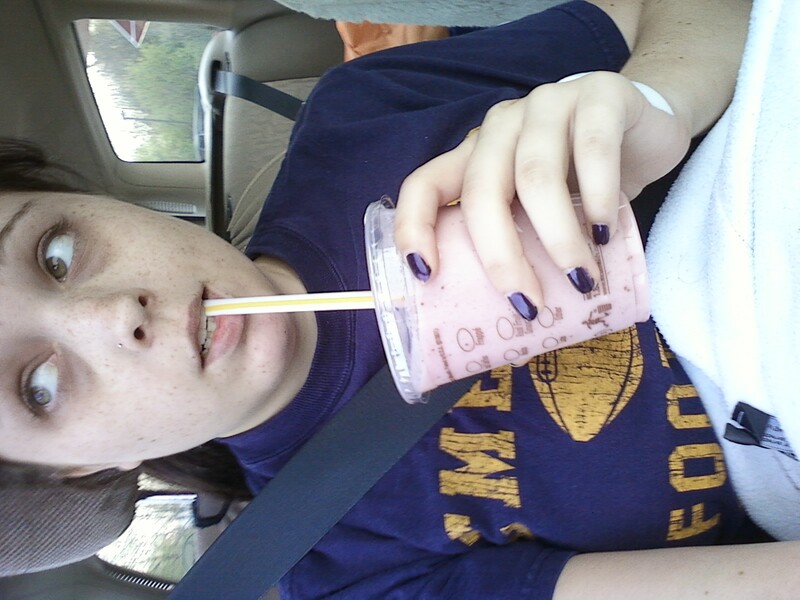 I got a smoothie on the way home from the hospital. It was delicious.